WiseBook is the solution for book and unique document scanning. WiseBook is a vital part of the modern digital interlibrary loan and digital document delivery. It simplifies the existing book digitizing procedures and produce perfect printer ready single and multipage images files from books and unique documents such as wills, land deeds, maps, cemetery records and more. WiseBook is used for huge repetitive jobs. It can help you with profuse multipage foliates scanning using advanced batch processing. The minute you form parameter templates for page scanning and handling, such as cutting, deskewing etc., you can set a batch order for the scanning and post-processing commands. The outcome is faultless scanned pages cleaned and consistently processed and stored in multipage raster files. WiseBook spontaneously cuts scanned books into pages. It is conceivable to line up the cutting according to different book-fold positions. Book-folds can be vertical or horizontal. There is also an option for trimming the book-fold area of the image on a particular page scan. Numerous cutting methods are accessible. It is possible to use the background color of the page to find the page area. The Book-fold area is usually darker as the gradient incline. WiseBook can spontaneously correct brightness of the book fold eliminating these gradients. This can also be completed in the post-processing of the image after separating the pages. 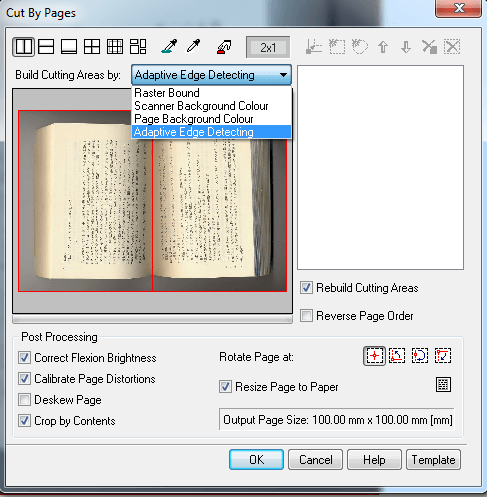 The user can check how WiseBook evaluates the cutting area. 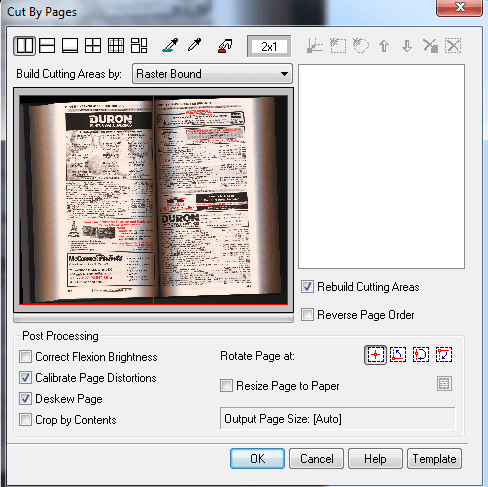 The cutting tool shows the calculated page border, book-fold place and brightness distortion areas for each page of the book covered on the image of the book. If the result is not suitable the operator can correct them manually. WiseBook is suitable for all scanner types. 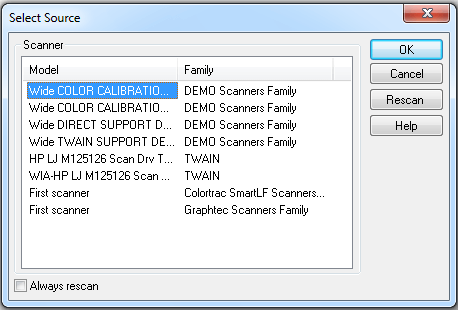 The Scanner interface consist of Direct support of wide-format and Twain scanners. WiseBook helps in Deskewing 4-point correction, calibration, changing size and resampling, cropping, rotating, mirroring. It also helps in Drawing on raster; integration color, monochrome, and grayscale images; monochrome and color flood filling. WiseBook can develop output of huge drawings or posters on small printers. If you want to print a large drawing on a small printer you need to assorted the original image with a little overlapped "slices" according to the output paper size. This purpose is for example used when you want to create a small size book from large maps, something WiseBook can easily do. A brilliance grid is castoff to estimate the brightness gradient on the book-fold. With this grid WiseBook can spontaneously correct geometric distortions on the page and try to approximate the shadow curves near the book-fold. The page image can be spontaneously deskewed. WiseBook estimates how skewed each page is and rotates the cropped page to 0 or 90 degrees. At times it is essential to crop scanned page images to the page contents therefore cutting off the page margins. WiseBook provides this option. Other options consist of: forced page rotation and fit page subjects to the closest standard page setup. 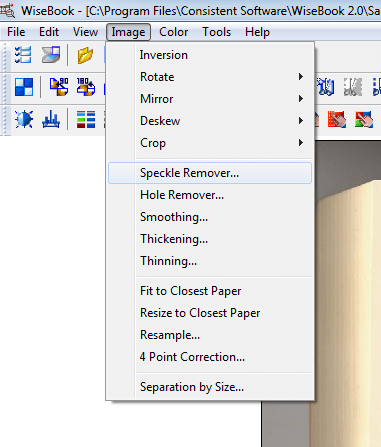 All considerations of the settings stated above can be saved as a template file for future use during batch scanning. WiseBook is for huge repetitive jobs. It can help you with profuse multipage foliates scanning using advanced batch processing. The minute you form parameter templates for page scanning and handling, such as cutting, deskewing etc., you can set a batch order for the scanning and post-processing commands. This order can be saved as a script file and used when you start the book scanning. There is a wide range of image processing commands that can be involved in the batch processing resulting in perfect, cleaned and uniformly processed scanned pages that are kept in multipage raster files. The files are then the electronic copy of your scanned books. The whole procedure automated by pressing just one button on the WiseBook toolbar.